Aprilia RST1000 Futura | Will there be another Futura? You are here: Home › Aprilia Futura History and Development › Will there be another Futura? Will there be another Futura? Will Aprilia ever build another bike like the Futura? In 2000 Aprilia bought Moto Guzzi and Laverda in the spirit of aggression that characterised its relentless expansion. But it bit off more than it could chew and the drain in its finances began to show. This page was written in 2008 and updated a few years later. It’s only here for archive purposes. 2003 saw Aprilia, already racing in World Superbike, enter Moto GP with the RS3 Cube. It was another massive money pit as the bike, with Colin Edwards (sometimes) aboard, struggled to 13th place. Then sales of scooters plummeted, and by summer 2004 Aprilia was in deep, deep trouble. For months the factory teetered on the brink of closure before being saved by scooter giant Piaggio, itself by then in Chinese ownership. In the years since, most of the rest of the stable of big vee twins were killed off. Falcos were sold off cheap before being killed off in 05, while Caponords struggled on a few years longer, then revived as a V4. No future for the Futura? The Tuono, on the other hand, went from strength to strength, receiving updates alongside the new RSVR and then the V4, while the 750cc Shiver and 850 Mana roadbikes have taken on the Futura’s mantle of technological bravery. The company’s sporting credentials were further enhanced by the launch of the RSV4 in 2009. Max Biaggi’s 2010 World Superbike Championship only helped matters but still no V4 version of the Futura has materialised. 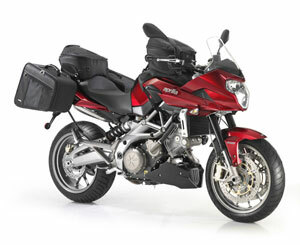 Is this the future of sports tourers as Aprilia see it? Some in the know say the Futura was ahead of its time – especially as far as its looks are concerned – and killed off too early, and point to the fact that the VFR took a while to catch on. But it’s hard to see what else Aprilia could have done, given their financial situation, and the market has moved away from sports tourers and towards the big trailie road bikes like the BMW GS. In the meantime Ducati quietly dropped their fast sports tourers. Meanwhile, although the Futura failed to sell, other manufacturers were quick to borrow from it. The Honda VFR VTEC and Triumph’s Sprint ST – arguably inferior bikes – resemble the Futura, and underseat exhausts became very common indeed. Will Aprilia make another Futura? Things are very different these days. It’s clear that the Aprilia marque has a specific role to fill within the Piaggio empire, and that appears to be racing and sports bikes, with a few naked technological oddities as middleweights thrown in. Aprilia is no longer the family-owned company that can dip a toe in any market, and the sports touring mantle seems to have passed to Moto Guzzi. Honda’s 2010 VFR1200 updated the concept, with opposition only from Triumph and BMW. Aprilia gives the Piaggio family of bikes racing credibility, but the writing may have been on the wall for the Futura as long ago as April 2000, with the Moto Guzzi takeover. Only time will tell, but it seems most likely that Aprilia will concentrate on sports and racing models, whilst Guzzi will be responsible for touring and custom bikes. But of course there will probably be the odd contradiction on both sides – certainly in the early days of the new set-up. And Piaggio politics aside, plenty of owners of out and out sports bikes are prepared to sling some luggage on their steeds and go off touring without the need for a bike that does the job as well as a Futura does. It doesn’t make the Futura a bad bike – it just makes it something of a niche market and Triumph haven’t done too badly with sales of the Sprint ST after all.